Transform your outdoor space with our beautiful wood Gazebo kits and custom redwood Gazebos for sale online. Our custom wood Gazebo kits add depth and style to your property, and can accommodate you and your guests with comfort and style that is unmatched. We use the highest quality redwood available, which is weather resistant, and 100% forest restoration lumber. Give us a call at (866) 332 2403 to get started on yours! 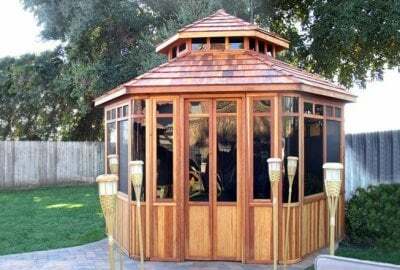 Create a brand new indoor space right in your back yard with our DIY Wood Gazebo. 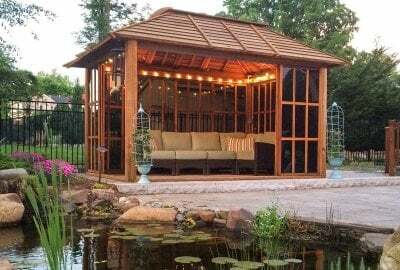 This covered walled Gazebo can be a private, quiet space to relax in, or a place to socialize with friends and family. You can even put your hot tub in there or transform it into a mini yoga/workout space. 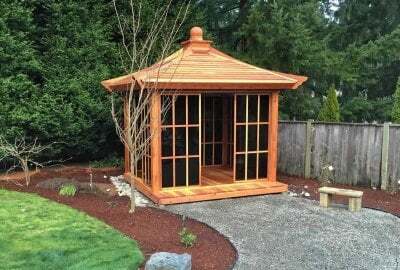 It’s all up to you, what you do with this custom made Redwood Gazebo kit. 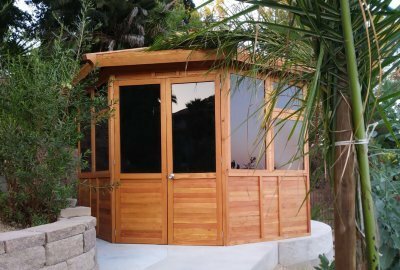 Everyone needs to unwind sometimes, and with our Spa Gazebo Kits, you can have the ultimate space for rest and relaxation right in your backyard. 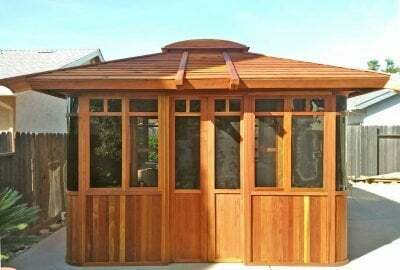 Our Custom Made Wood Spa Gazebos are perfect for your hot tub, massage table, meditation room, or even hammocks and comfy chairs. 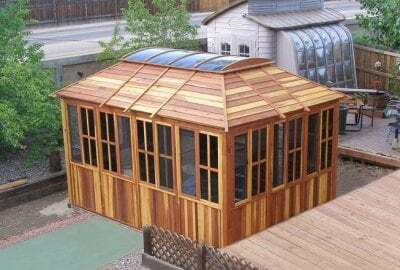 The Spa Gazebo Kit even has a sunroof to let in all of those beautiful rays, regardless of the season. Make your outdoor addition dreams come true with our beautiful Redwood Dream Gazebos. These Gazebos are meant to inspire and offer you a unique and stylish space for your backyard or garden. The Redwood Gazebos are meant to give you an area with tons of natural light, and fresh air, all while providing an elegant indoor space for you and your family. These Gazebos truly are a dream. Check out our new take on traditional Gazebos with Don’t Hexagonal Gazebo Kit! This unique and functional design will make a perfect addition to your property or business. This hexagonal gazebo is dynamic, stylish, sturdy, and spacious and can be customized to fit your needs, whether big or small. Create a versatile, private space, right in your backyard! Yes! A real traditional Japanese Tea House! The gorgeous, supremely flexible design takes you from complete privacy to a sun-filled open pavilion in seconds. 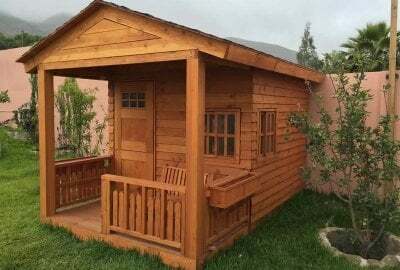 It was designed for kids of all ages, The Kid's Backyard Cabin is a wonderful retreat area that can be built the size you need and to your specifications. Dream on indeed!